OS BIG Editor is an open source .BIG file browser and, soon to be able to create and edit .BIG files as well. 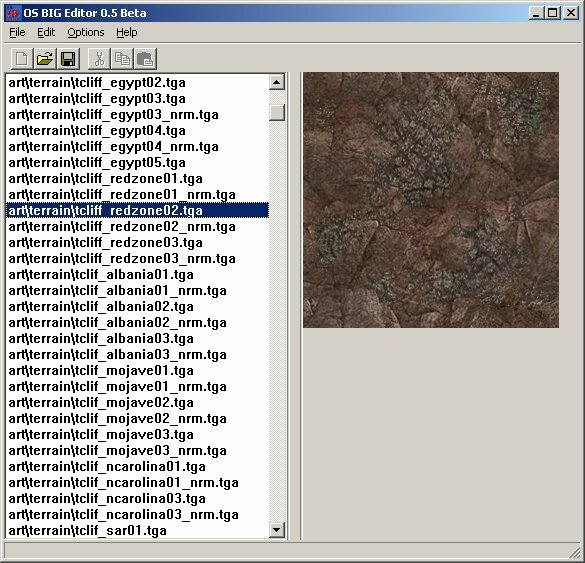 The .BIG files are packages of files used on games made by Electronic Arts Los Angeles, like Command & Conquer Renegade, Command & Conquer: Generals, Lord of the Rings: Battle For Middle Earth I, Lord of the Rings: Battle For Middle Earth II and Command & Conquer 3: Tiberium Wars. -> Browse .BIG files from Renegade, Generals, Battle For Middle Earth I and II and Command and Conquer 3, including the compressed files inside them. -> A quick and friendly interface that allows the user to quick extract the files, including through drag and dropping them to Windows Explorer. -> Preview all TGA and text files without extracting them. -> Associate your .big files with the program to open them straight from the Windows Explorer. -> Online support and help at Project Perfect Mod Forums. This program counts the (direct or indirect) contributions from Jonwil (Refpack decompression code), Danny van Loon (Drag and Drop support), Zlatko Minev (TGA Viewer) and Davie Reed (TGA support).